Give the gift of music with the Skullcandy ​Crusher 360! These wireless over-the-ear headphones feature patented Skullcandy technology that delivers a unique sensory vibration to your ears! You can literally feel the bass with these Bluetooth wireless headphones. Both comfortable and stylish, these headphones feature memory foam ear cushions and a stylish design. On one charge you can have 29 hours of battery life to listen to all your favorite tunes! This is the perfect gift for anyone that loves great sound! Give the gift of flexibility with the Plantronics BackBeat FIT Wireless Sport Headphones! You will be ready to go the extra mile or ten with these flexible and durable headphones! The BackBeat FIT features a waterproof design that meets the IP57 rating and an additional sweatproof nano-coating. These headphones are perfect for a run, workout or for travel and come with ulimited access to 12 PEAR Personal Coach App workouts, plus a 6-month membership to PEAR+, which includes interactive audio coaching from world-renowned trainers and athletes. This is the perfect gift for anyone that wants to step up their game! Give the gift of music on the go with the iHome Aquio Bottle! This stylish 16oz. bottle is BPA Free, double wall insulated, and keeps your beverages cold up to 24 hours and hot up to 14 hours. With an iHome detachable Bluetooth speaker you can enjoy music anywhere you go! The bottle is perfect for bringing along on workouts or travel. This is the perfect gift for anyone that is always on the go! Give the gift of convenience with the FABRIQ Chorus Voice- Activated Alexa-Enabled Wireless Smart Speaker! This small speaker packs a BIG sound. The 2" precision active driver along with 5W of power provide crisp sound at any volume. Using W-Fi, you can connect up to 10 FABRIQ speakers for a multi-room sound experience. You can play music synchronously through your home or chose different songs for different rooms. With Alexa, you can play music from Spotify, Amazon Music, iHeartRadio and TuneIn and access your books from Audible. Bluetooth capability allows you to bring your portable FABRIQ speaker anywhere you go! Give the gift of Music with the Anker SoundCore Flare Bluetooth Speaker! The portable bluetooth speaker with 360 degrees of immersive sound and lights will fill your space with fun and energy! The speaker features a 12 hour battery life and is Waterproof allowing you to take the party anywhere and everywhere! 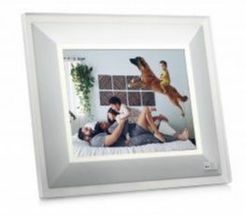 Give the gift of memories with the Aura Frame! This digital frame allows you to display your photos wirelessly by using Bluetooth or WiFi to upload pictures to the device. It's so simple to add photos to your frame you can even add photos directly from your smartphone! You can also have friends or family share their pictures on to your frame using the Aura app. Photos can change at a pace you choose or it can take cues from the environment. This frame is also energy conscious and uses a minimal amount of power with auto dimming and automatically goes to sleep when the room is dark. The frame comes elegantly packaged and ready for gift giving! 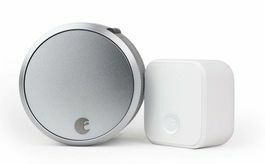 Give the gift of security with the August Smart Lock Pro + Connect! ​Turn your front door into a smart door easily with this lock, which also allows you to lock and unlock your door from your phone! From your phone you can lock and unlock your door from anywhere. Give keyless entry to family and friends, or schedule access for home services without worrying about lost or copied keys. The lock easily attaches to your existing deadbolt. With August's proprietary DoorSense technology, you will know your door is completely closed and locked. You can even tell Alexa, Siri or the Google Assistant to control your August Smart Lock! Give the gift of security with the ​KidsConnect GPS Tracker Phone! This phone is a parent's "All In One Security Solution." It is the best solution for parents to obtain peace of mind while their kids are away from home. The KidsConnect GPS Tracker Phone is equipped GPS/LBS Location which allows real time tracking of the phone via the Android or iOS App. Parents can also see where their kids have been with the location history feature. The SOS feature when activated will send a text message with the GPS/LBS location to up to 4 cell phone numbers and then it will auto-dial the numbers on the SOS list until one is answered. The GeoFencing feature allows parents to set a predetermined area and receive an alert if the phone enters or leaves the area. This phone is the perfect gift to keeping your child safe and secure! Give the gift of Alexa in your car with the Anker Roav VIVA! This device gives you complete voice control in your car allowing you to get directions, listen to audiobooks from Audible, shop online, play music, and more over Bluetooth, Carplay, Android Auto, or an Aux in connection! The VIVA also provides high-speed charging with dual charging ports equipped with Anker's exclusive PowerIQ technology deliver blazing charging speeds to both driver and passenger. It also supports calling, messaging, drop in, and announcements through Alexa- all hands-free! This is the perfect gift for anyone that is always on the go! Give the gift of security with the Anker ROAV DASHCAM S1! This dashcam records 60fps to clearly capture speeding vehicles in crisp 1080p resolution. With a high-sensitivity Sony Starvis sensor, the dashcam ensures balanced, detailed nighttime capture. A gravity sensor automatically activates the camera if your car is bumped to record hit-and-runs. The dashcam also includes a Roav app that tracks your route so you can replay any part of your journey, manage videos, and share recording on social media, with a tap. The Roav DashCam S1 includes a 2-port car charger, Micro USB cable, 32GB microSD card, trim removal tool, two 3M sticker mounts, user manual and a 12-month product replacement warranty.